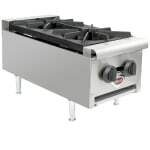 Wells Gas Countertop Heavy Duty Hotplates are designed for use with either natural or LP gas. Hotplates are factory configured for natural gas and are field convertible to LP gas. Each burner has an adjustable air shutter to control primary air. Removable drip pan and burners provide easy clean-up. Stainless steel housing with removable front panel to provide easy access to components. Durable cast iron burners provide superior flame characteristics, faster heat-up, immediate turn-down and gentle true low heat. Each burner has as adjustable air shutter to control primary air and provide optimum combustion. Each burner has ON/OFF control valves that provide infinite heat adjustment. Removable drip pan and burners for easy clean-up. Heavy duty 4' steel legs.